My name is Mike Miller and I’m a photographer hailing from the home of the scandalous, big bad Los Angeles. I got into photography at 26, while doing odd jobs in Paris and living next-door to an agency model apartment. One day my roommate gave me a camera and I began setting up shoots with my neighbor and her friends–hoping it would result in some type of relationship [laughs]. This is when I started to realize how much I enjoyed what I was doing and ended up saving $200 to purchase a Nikon F2 from supermodel Linda Evangelista, who originally got it from the infamous Peter Lindbergh. Shortly after building a name for myself in the European fashion world, I paired up with Herb Ritts’ Vistage agency, which informed me that record labels were interested in my work. My first actual music-related job was for A&M Records. I shot an album cover for The Go Go’s, which they ended up using for a billboard. Soon after, I linked with DJ Muggs and helped develop the imagery for Cypress Hill. 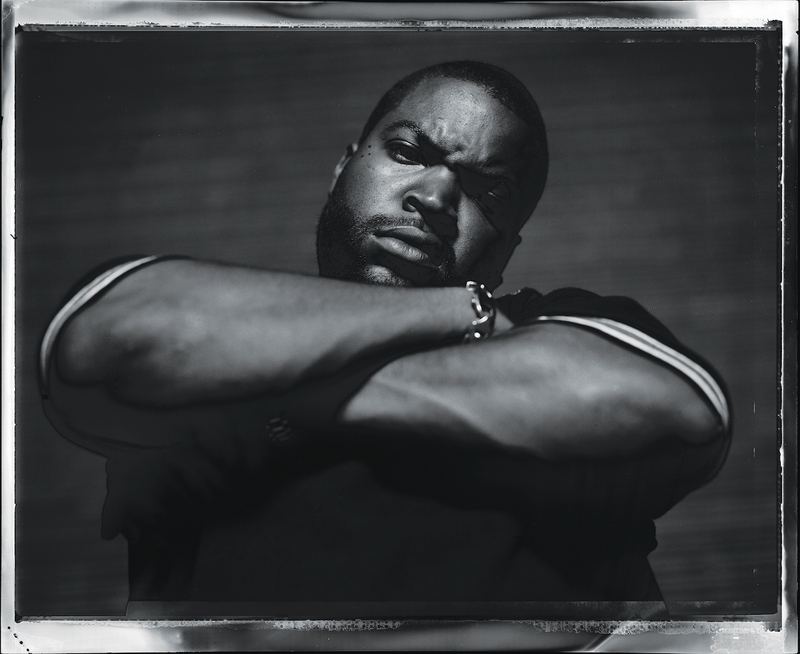 Fast forward to 1989, I was contacted by RCA records and shot my first hip-hop cover for N.W.A. member Arabian Prince. Within no time, I began working with Coolio, Warren G, Westside Connection, Tupac, Snoop Dogg, and other icons around LA. As a huge rap fan, this was something special. While waiting for Eazy to arrive on set, I started skating in the parking lot. Before I knew it, he pulled up in his new BMW, popped the trunk, grabbed his deck and we skated for a minute. 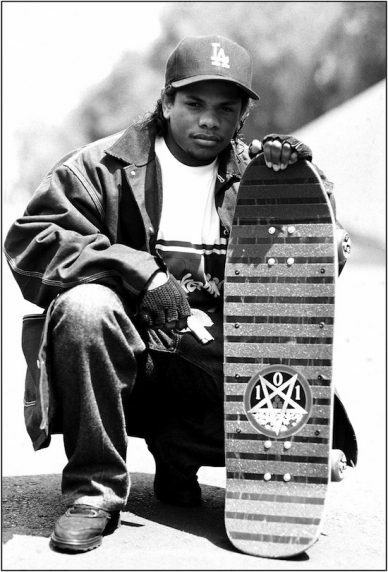 Since I grew up skateboarding and listening to N.W.A., I was trippin’. His board was actually my homie Nate Kaupas’s model. This photo is actually an outtake from the Westside Connection’s album cover shoot. I captured this with Polaroid 665 negative film but the actual cover was taken with a film 667 camera. I rented a giant stage so I could pull cars onto it and had a good alley to do street shots. It was a typical daylong event and we shot a ton of film. 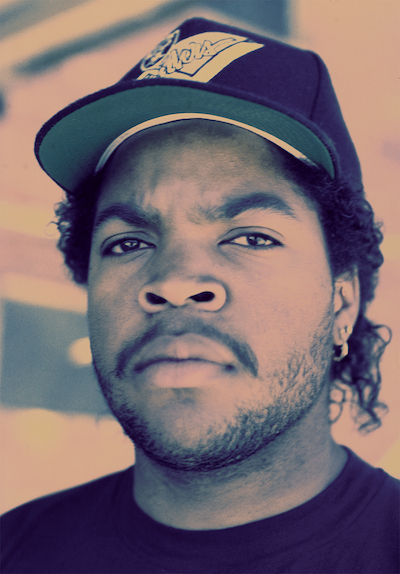 Even though this photo was for Westside Connection’s cover, he used shots from this day for other covers as well. I had a great working relationship with all three members and did a massive amount of work with them. 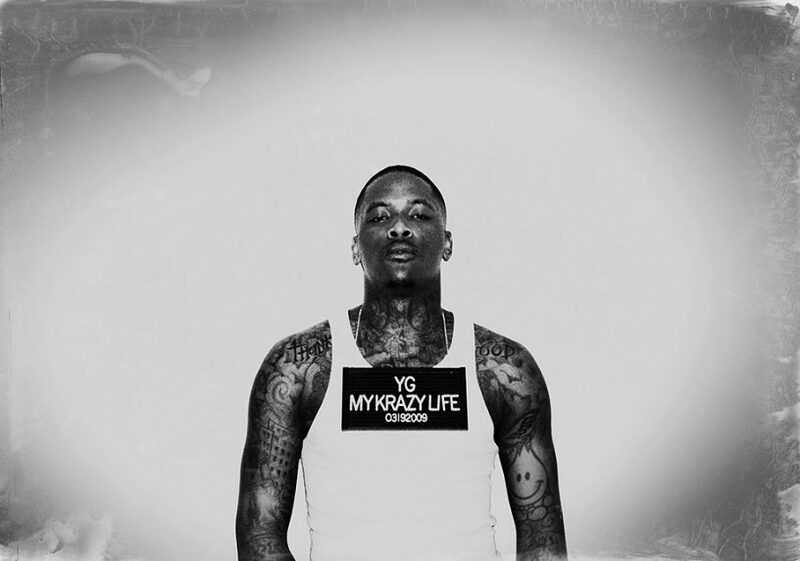 I think of YG like family. We hit it off after our first shoot. He’s easy-going, funny and reminded me of one of my little brothers. He hired me to shoot his first cover, second cover and to film a documentary as well. This photo was actually taken in Hawaii. We got the mug shot plaque from the TV show Hawaii Five-0. It was my wife’s idea to style him in a beater. I headed out to the Street Knowledge headquarters to photograph publicity shots for Ice Cube’s AmeriKKKa’s Most Wanted. Cube had just moved camp to Public Enemy’s Bomb Squad production team, so everyone was still in shock that he left N.W.A. After relocating his office in the rolling 60’s hood, he was all business this day. At this point , ‘Pac was already hugely successful. Before our first photo shoot, I received a call from Interscope Records telling me Tupac wasn’t allowed to bring [weapons]. I literally had to remind Tupac to leave [them] at home (laughs). We met at his condo in the Hollywood Hills on Fuller Ave. We sat down and talked about the shot list. I pitched the idea of taking Tupac from Hollywood to all the local hoods–Rollin 50’s, East Los, Pasadena and ending up on Hoover and 6th in Downtown LA. He gave me the green light. I rented a 15-seat van so we all could drive together. Tupac sat shotgun. The first stop was in the Rollin 50s south central LA. There used to be a storefront with hubcaps hanging on the outside wall and an old barber’s chair on the sidewalk. I always set up my shoots like a movie or a scene from everyday life. Once the word got out that Tupac was in the neighborhood…we bounced. I distinctly remember a guy rolled up in his wheelchair and asked Tupac for money. He broke him off some. My wife, Shannon, helped me find spots and this was one of her locations. 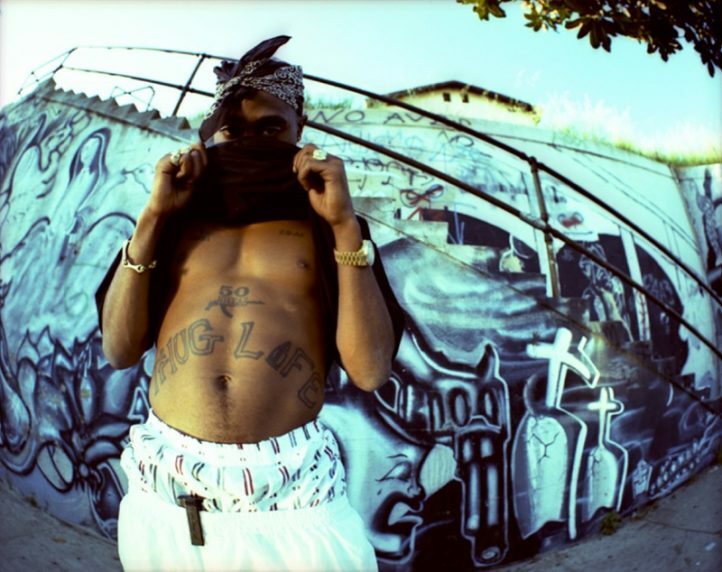 She even styled Tupac on a few of his shoots. I had him running up and down the street as I snapped footage. All of a sudden, a gang member started yelling at us from his car parked in the middle divider of the road. He told us that the mural was dedicated to his dead homie and that we better be gone by the time he came back with his crew. This [annoyed] Tupac so he yelled back and started chasing the car on foot. The gang member started to drive off saying he’d be back. During all this, my wife and the art director ran and hid in the van. Luckily, Tupac had the commonsense to know it was time to leave. Along with the fame came unwanted hostility; it was like he was a target. A few months later, I was at a supermarket on Sunset and PCH when a purple convertible Bentley pulls up and it was Tupac. He was shopping for a BBQ to put at his rental in the Malibu Colony. He invited my wife and me to his beach house.